US President-elect Donald Trump has effectively sunk the Trans Pacific Partnership (TPP), the broad trade and investment agreement that formed the economic centrepiece of President Barack Obama’s “pivot to Asia” against China. In his brief policy video on Monday, Trump confirmed his “America First” protectionism by declaring that on day one of his presidency he would issue a note of intent to withdraw from the deal. Trump’s announcement was a slap in the face to US allies and TTP partners gathered at last weekend’s Asia Pacific Economic Cooperation (APEC) summit in Peru who had been urging the president-elect to reconsider his stance. The decision can only heighten uncertainty in Asian capitals in the wake of the election of Trump who has not only called into question Obama’s “pivot” but the basis of the post-World War II order in the Asia Pacific, in particular the US-Japan Security Treaty. Just hours before the release of Trump’s policy video, Japanese Prime Minister Shinzo Abe declared that the TPP would be “meaningless without the United States.” He scotched suggestions by other TPP partners attending APEC to press ahead with the formation of the trade bloc without American participation. Without the US and Japan, the world’s largest and third-largest economies, the TTP will be reduced to a shadow of itself, if it survives at all. The TPP was never a “free trade” agreement. It was the means by which Washington sought to undermine Chinese economic influence and consolidate its own dominance in Asia and internationally. As Obama declared, the TPP was to ensure that the US, not China, wrote the rules for the 21st century global economy. It included the protection of US intellectual property, provisions for American corporations to sue governments if national regulations cut into their profits, and measures against state-owned enterprises. The TPP has always been integral to the Obama administration’s diplomatic offensive and military preparations in the Asia Pacific for war with China. Obama’s defence secretary Ashton Carter underscored its strategic significance by declaring that the “TPP is as important to me as another aircraft carrier.” The US military build-up in Asia has included the strengthening of alliances throughout the region, new basing arrangements in Australia, the Philippines and Singapore, and plans to station 60 percent of naval and air assets in the Asia Pacific by 2020. Trump’s punitive trade measures will not only impact on China, but on American allies such as Japan, South Korea and Australia, for whom China is the largest trading partner. 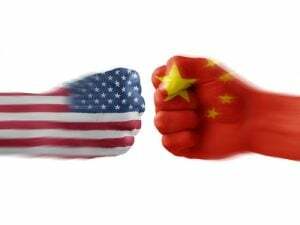 According to Daiwa Securities, a 15 percent tariff on Chinese goods would result in a 1 percent fall in Chinese economic growth and significantly also lower growth rates in its trading partners. In the midst of the acute uncertainty following Trump’s election, governments in Asia and around the world are being compelled to re-evaluate their economic and military strategies. Japanese Prime Minister Abe and other foreign leaders have already warned that if Trump kills off the TPP, they will be compelled to work with China to conclude its rival trade agreement—a Regional Comprehensive Economic Partnership (RCEP). As Abe pointedly noted prior to the APEC meeting, RCEP includes most Asian countries as well as Australia and New Zealand, but not the United States. By declaring that the TPP would be “meaningless” without the US, Abe effectively ruled out a trade bloc that Japan would lead de facto and thus pose another challenge to US hegemony in Asia. While Abe might not be prepared to confront Washington, others in the Japanese ruling elite are already suggesting that Tokyo has to consider a more aggressive defence of its own economic and strategic interests. Shigeru Ishibi, a powerful figure within the ruling Liberal Democratic Party who has twice challenged Abe for the leadership, declared on Monday that Japan would have to take a different approach after Trump assumes office. “Japan can’t just sit back and do what it’s told to do by the United States. We must make active proposals and swiftly reform our foreign policy where necessary,” he said. While not suggesting an end to the US-Japan Security Treaty, Ishibi called for full-fledged preparedness and more assertiveness on Tokyo’s part. Trump’s aggressive trade war measures will greatly exacerbate geo-political rivalries throughout the region that could bring the US into conflict not only with China but also traditional allies like Japan. In historic decline, Washington no longer has the economic muscle to lay down the law in Asia or anywhere else and is compelled to resort to military means. In reality, what a Trump administration is preparing to initiate is a trade war and arms race in Asia that risks an open military conflict. The roots of this accelerating drive to war lie not in the personality of Trump but in the deepening crisis of world capitalism that is driving global and regional powers to impose the burden on their rivals abroad and the working class at home.